For the 2016 PDGA Women’s Global Event, the PDGA will be supporting Right To Play, a global organization that uses the transformative power of play to educate and empower children facing adversity. Through playing sports and games, Right To Play helps over one million children learn to create better futures, while driving lasting social change in 18 countries each week. Founded in 2000 by social entrepreneur and four-time Olympic gold medalist Johann Olav Koss, the organization’s mission is to use sport and play to educate and empower children and youth to overcome the effects of poverty, conflict and disease in disadvantaged communities. 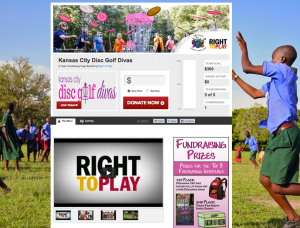 The Kansas City Disc Golf Diva’s have our team’s Right to Play page live and ready for donations. Top Fundraising Team Prize: The winning team will receive their own feature article write up on PDGA.com, receive a special mention in the Fall DiscGolfer magazine, and be listed as the Top Fundraising Team on the PDGA Women’s Global Event page. In addition, the team captain will receive 2 free one year PDGA memberships, a free KEEN shoe card, and a $100 gift certificate to huklab to distribute among their team. Your gift changes the lives of children struggling to get a quality education, lead healthy lives and live in conflict-free communities. Your support plays a critical role in reaching over 1 million children every week in programs across Africa, Asia, the Middle East, Latin America and Canada.